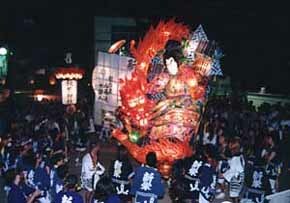 Mando Festival was started in 1778 at Akiba Shrine. and dance with a band music. The first day (Sat.) is called "Shinraku". Young men carry the mando and parade in the town. The second day (Sun.) is called "Honraku". Dancing is offered in Akiba Shrine. Get off at Kariya-shi sta. on the Meitetsu Mikawa line.